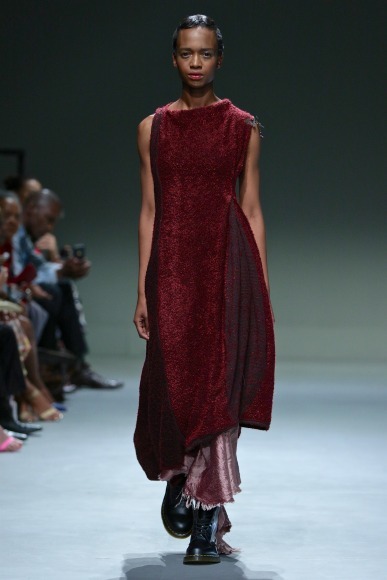 The fashion label Sies! aims to create clothing items that flatter and complement the womanly shape. The designer hopes that her garments will provide a sort of blank canvas that the wearer can add to and layer to her own desires as required. 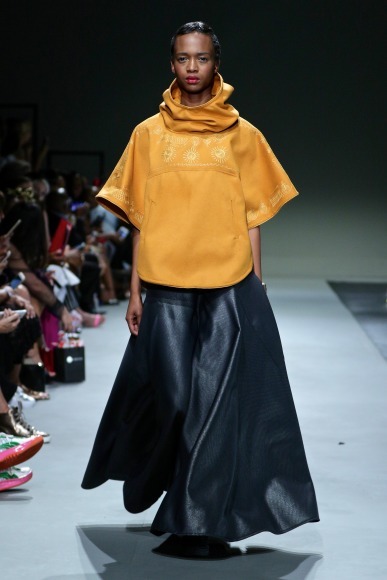 Impressions…Firstly, it was super cool of the designer to use this platform to spread the message #feesmustfall in support of the recent iconic protest by South African students against increased academic fees in 2016. Secondly, what I thought about this collection…It definitely complements the feminine form and does so in a way that is not typically the norm. 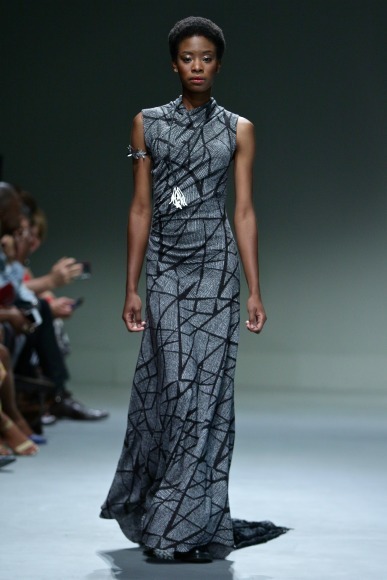 Floor length dresses that nicely fits and shapes the feminine silhouette aligns with what the label is known for. 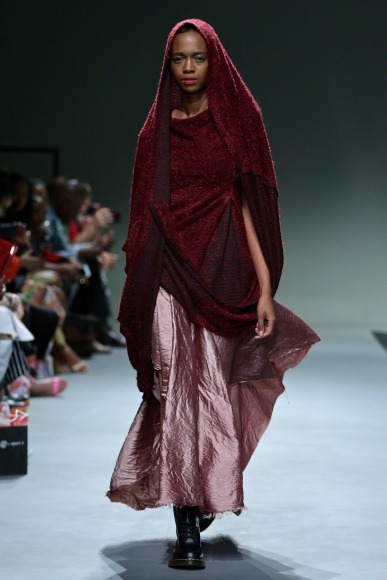 I particularly liked the dress with the hood that’s reminiscent of the religious garb worn by Islamic women – very African. The designer behind the clothing label “Sober” aims to offer classic, timeless pieces of clothing that’s both carefully-detailed and styled uniquely. Impressions….This collection was such eye-candy! The pieces are timeless indeed with a military, war-time feel to it. Although war-time is a very negative situation, its context was used to create these beautiful pieces. The use of graphic designs, other than colour, is an alternative way to brighten up a gloomy autumn/winter day. The colours and fabrics chosen are very rich and decadent – e.g. the suede black and beige – which in itself gives off an aura of warmth. A good balance of colour and fabric is used to cure the winter blues and make the wearer feel warm inside and out. 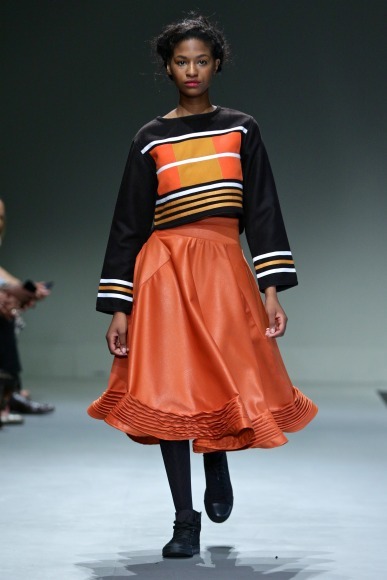 Mantsho is a Sotho name meaning “brutally black” when translated into English. 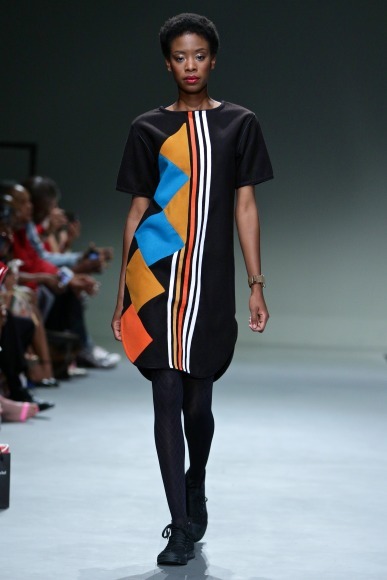 The label is known for being vibrant, bold and expressive. Impressions….This collection is funk deluxe, without a doubt. Meant for those who don’t like to be fit into a box, that choose to live boldly and express it with their outfit choices. 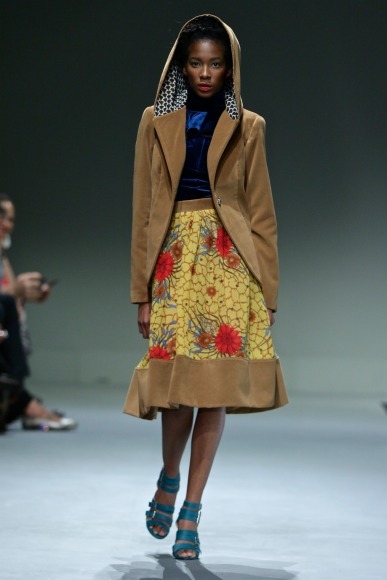 The colours are vibrant blue, yellow and orange and the dominant fabric is leather – skirts/dresses – that bear intricate designs and details. 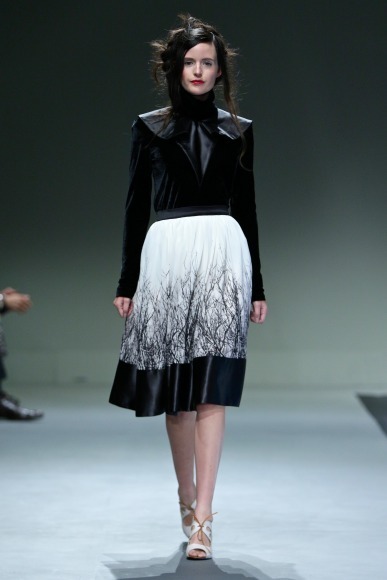 This was one of my favourite collections – it has a futuristic style that I absolutely love.